This is the first in a series of short (3 page) articles based on the same extensive testing you're used to. You'll find almost everything that appeared in earlier articles, but without all of the extra words. Be sure to look at the slide shows on page 2. The images and their captions provide all of the information you're used to getting in a much more encapsulated form. If you're looking for a hot gaming notebook, I suggest you seriously consider Eurocom's D900K F-Bomb. Its Nvidia GeForce Go 7800 GTX graphics subsystem is one generation behind the current Go 7900 GTX. Still the D900K provides enough frames per second to power most games, especially at a display resolution of 1024x768. The notebook is large and heavy and, at the peak of gaming action, is noisy and generates lots of heat, yet it has the kind of grandiose look, feel and functionality that seasoned gamers will appreciate. If you love monster cars, you'll love the D900K F-Bomb. The D900K is compared with Dell's XPS M1710 here. For more on the M1710 check out the two part review (Is Dell's XPS M1710 The Fastest Graphics Notebook Ever? Part I) and (Is Dell's XPS M1710 The Fastest Graphics Notebook Ever? Part II). What's the difference between the D900K and the M1710 gaming notebooks? Check out the specs in the chart below. And then join me on the next page where you'll discover pretty much everything else you might want to know about the D900K and what distinguishes it from the M1710. Things are getting pretty exciting at MobilityGuru these days. My rant asking if gaming notebook vendors were afraid of the site brought some positive responses from hot players in the field. It also elicited lots of suggestions from you guys. Between the responses and your input, things are moving quickly on the gaming notebook front. In fact, I'm discovering that many so called "gaming notebooks" have blossomed out into a new breed of very high powered mobile workstations that offer endless opportunities for graphically oriented users. We're about to start testing Eurocom's D900K F-Bomb. This behemoth has a dual core AMD 64-bit processor, lots of memory and disk storage as well as a great Nvidia graphics processor. We're going to subject the D900K to a whole range of benchmarks, including some specifically designed for 64-bit hardware running Windows XP x64. Eurocom calls the D900K F-Bomb a "mobile workstation" instead of simply a gaming notebook. I'm sure it's chosen this moniker at least in part because there's quite a bit of insecurity in the mobile computing market about the future of PC-based gaming, given all the hot new dedicated gaming boxes out there now and previewed at E3 this week. I believe "mobile workstation" really is a better name for these monsters. They can do so much more than role playing as gaming consoles. The D900K is capable of 8 channel 7.1 audio, making it a great candidate for serious sound editing with the right application software. An optional external Windows XP Media Center Edition TV tuner opens the door for all kinds of broadcast, satellite and cable video-oriented stuff. And, video editing should be a pleasure on the D900K. As a digital photography/PhotoShop junkie, I would love to have one of these spawn of Eurocom to lug around on my out-of-studio shoots. And designers and architects would be very happy to run their favorite applications on this workstation. I almost forgot my friends in the special effects business. Companies like George Lucas' Industrial Light and Magic now bring high powered AMD-based notebooks to the sets where the live-action parts of a film are being shot. Within minutes after a scene is done the director can see how live-action and special effects blend and roughly how the final scene will look. All of this is not to slight the D900K as a serious gaming machine. It's just to point out that when you spend lots of bucks to buy a big Bertha notebook you should expect it to be more than a one trick pony, especially given you can get a very nice standalone gaming console for peanuts compared to the cost of these high end workstations. A CANADIAN company that likes the old continent so much that it named itself after it, announced an astonishing notebook. It decided to announce a machine branded the Eurocom F-Bomb. This product is mostly for North American and maybe for European consumers. Eurocom plans to pack a bunch of everything in its notebooks. It will offer a choice between 17.1-inch WSXGA display supporting 1680-by-1050 pixels with a glossy surface or a super big WUXGA 1920-by-1200 pixels display. You will be able to plug dual core Athlon X2 CPUs up to 4800+ or single core up to 4000+ and FX57. You will be able to plug GB DDR400 modules into two memory slots. 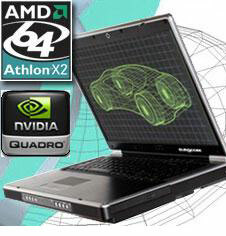 You will be able to choose your upgradeable graphics between 256MB GDDR3 Nvidia Quadro FX 1400, 256MB GDDR3 Nvidia 6800, 256MB GDDR3 Nvidia 6800 Ultra, 256MB GDDR3 ATI Mobility Radeon x800 or 256MB GDDR3 ATI Mobility Radeon x800 XT Platinum Edition. We are sure that this notebook will be able to support Geforce Go 7800 GTX as soon as Nvidia announces it. When it comes to storage, there is a space for two parallel or S-ATA hard drives and a RAID 0.1 controller. You will be able to plug up to 240GB of this type of storage in. There is a place for two optical drives of your choice. This machine is not missing anything as you will be able to find an internal MCE TV tuner for your TV pleasure. The notebook is equipped with a web camera for video conferencing and 10 in 1 card readers. When it comes to sound, the machine has 7.1 Surround Sound output, supports SRS WOW and can create virtual eight channel audio output. This is not all, it has a DVI port, four USB 2.0 ports and two Firewire ports. Don't go wild on the configurator if you're counting your pennies and want them to turn into pounds.